We enter Reception class from many different Nurseries, but we have many chances to meet the other members of the class and our new teachers, as well get the chance to play in our classroom! Before we start school, we are invited to different open days and events such as our Buddy Afternoon. This is when we meet our new Year 6 buddy who will work with us throughout the year and help us to settle into our new school. In the first term the adults in Reception help us to make new friends and become familiar and confident in our new school. They introduce us to new routines and work with us to set rules for our classroom. We love working hard and being kind, and our teachers show us they are pleased by giving us team points, stickers and even smiley faces! Once we have filled our smiley-face card, we get to show Mrs Whitehead, who rewards us with a prize – this is very exciting time indeed! We are very lucky to have such lovely school grounds. We love using our outdoor areas for our learning. 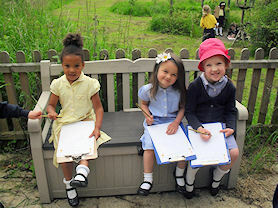 Outdoor learning forms part of every-day learning for us in Reception. 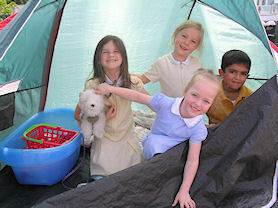 We love playing outside, especially den-building! 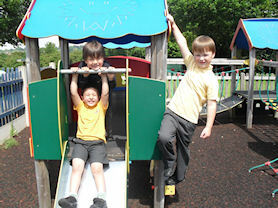 We have a fantastic climbing frame in our Reception playground. 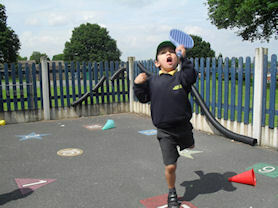 PE takes many shapes and forms in Reception. 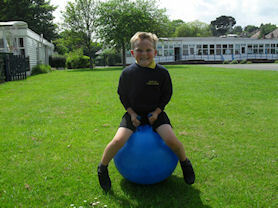 Our playground is set-up for us to enjoy a wide range of activities. 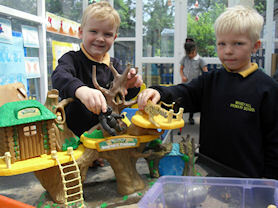 We love using our small-world toys to tell stories and develop our interaction skills.